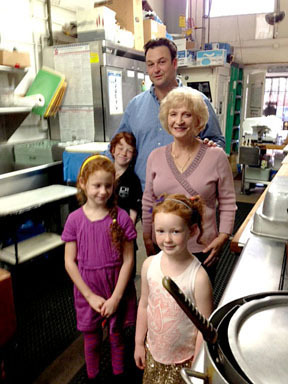 IN GIRASOLE KITCHEN are Sonia Tulot, Steve Vernetti with his children Bruno, Stella and Lola Vernetti. Steve and Joanna Vernetti had been eating at Girasole since they moved to the neighborhood 10 years ago. Steve, who has a background in the food industry, dreamed that one day he might own the restaurant. The opportunity came true recently when Sonia Tolot decided to step down. Sonia, widow of the restaurant founder/owner Ermanno Tolot, was delighted to have found a buyer. The restaurant has been a favorite on Larchmont Blvd. for almost 20 years, and specializes in traditional Northern Italian cooking from the Veneto region, home of the original owners. Vernetti spent six years in London in food-related businesses after he graduated from Chico State University, and when he arrived in Los Angeles in 1997, he joined the Patina Restaurant Group. His plans are to continue the family/neighborhood atmosphere of Girasole (which means sunflower in Italian). “Lunch menus will offer soups, salads and sandwiches. Steaks, chops and Italian specialties will highlight the dinner menu,” said the new owner. His wife Joanna also works with food.